CHARLOTTE -- It all happens in the blink of an eye, but there’s a coordination that’s happening within the Thunder defense from the moment the opposing point guard crosses half court. The man on the ball loads up to force the attacking guard to his weak hand. If a screener comes, the Thunder big man shades the driver aggressively, with hands up into the passing lanes. All three defenders, depending on their assignment’s location, make a move towards the middle of the floor to wall off any attempts to slash to the bucket. The ballhandler is up against the sideline along the wing, perhaps even pinned into the corner, with five long, limber Thunder defenders itching for him to make the tiniest of mistakes with the ball. It’s a synchronized dance, and when the Thunder has it working, it can produce majestic results. As the Thunder hits the road to commence an Eastern Conference back-to-back, with the first stop coming in Charlotte in a battle with the Hornets, that defensive cohesion will need to be a top priority. At point guard for Charlotte is Kemba Walker, who in the early going of the 2018-19 campaign is averaging an incredible 30.1 points per game, second most in the NBA. That’s not it for the Hornets backcourt, however, as youngsters Malik Monk and Jeremy Lamb are both shooting nearly 40 percent from the three-point stripe, while the second unit is graced with an NBA legend – Tony Parker. The long-time San Antonio Spurs point guard is in his first season in a different jersey, but still remains a productive and potent threat as a playmaker. On Tuesday against the Miami Heat, Parker notched game-highs with 24 points and 11 assists in just 25 minutes. Under new head coach James Borrego, the Hornets have been productive scoring the ball so far this year, ranking ninth in the NBA in points per game and also three-point percentage. With that bevy of guards popping the ball around the perimeter, the Thunder must be ready to handle all types of actions and dribble drives. Falling a step behind and playing catch up will not be an option as the Thunder looks to extend its win streak to three. 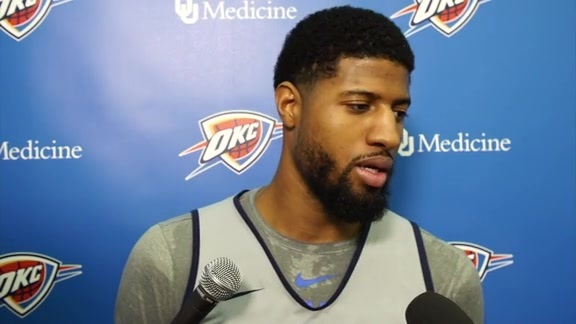 - Besides Andre Roberson, everyone on the Thunder was healthy and participated in shootaround this morning in Charlotte. - The Hornets come into this game attempting 34.5 three-pointers per night, making 37.7 percent of them. The Thunder, however, has allowed the fewest three-point attempts per game in the league at just 25.5. The key is contesting them, particularly the ones in the corner. Last game, the Thunder held the Clippers to just two corner three-point attempts the whole night. Without flying past and being reckless, the Thunder has to confidently close out to the corner tonight against Charlotte, without fouling. - More and more, Thunder fans are seeing an offensive evolution taking place in Oklahoma City. One way in which that is occurring is through Russell Westbrook’s movement and cutting off the ball. In years past, Westbrook has been the lead ballhandler at all times, required by circumstances to make plays for himself and others. With Paul George and Dennis Schröder in the mix, Westbrook’s been able to rely on a little Team USA experience to find open seams in transition and the halfcourt to catch and go while on the run. - Another emerging development for the Thunder is the continual improvement on defense from third-year guard Alex Abrines. The Spaniard made four steals in just 15 minutes against the Clippers, in addition to blocking a shot. Abrines’ ability to defend without fouling gives the Thunder a crucial weapon – the chance to keep extra shooting on the floor without sacrificing defensively. - Another Thunder player who was an absolute menace on defense on Tuesday night was second-year guard Terrance Ferguson, who spent all game harassing Avery Bradley, Lou Williams and Shai Gilgeous-Alexander. Ferguson’s box score wasn’t gaudy, showing just one assist, one block and two points, but his effort and disruptiveness popped off the court.